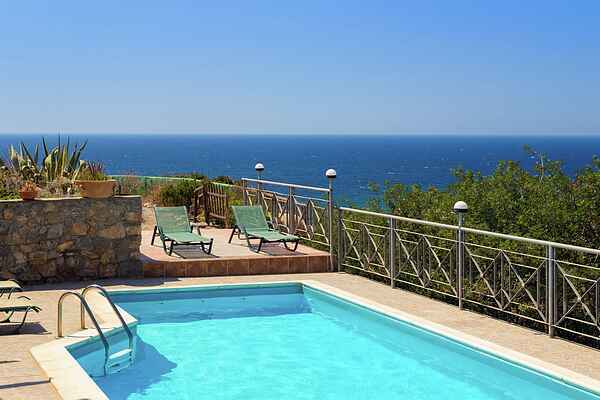 Livadia villa, a stone built villa, has a large 12x4m sized swimming pool with sun beds, portable BBQ and a sun block pergola with lounge furniture, where you can enjoy the spectacular sea views. The interior splits in to two levels of different hight. The first one has the living room area, a dining area and fully equipped kitchen. Large window doors offer magnificent views of the landscape even from the house interior. The second and higher level constits of a comfortable double bedroom with ensuite bathroom and a twin bedroom. The double bedroom has direct access, to a balcony and to the pool area. The house can accommodate in beds up to 5 people, with an extra bed available in short notice. Livadia villa has been named after the village, a quiet and peaceful place. Terrain is mountainous that meets the sea level and vegetation is dense, with many trees, herbs and flowers. You can swim at about 200m from the villa but it is a bit rocky, a better choice is at the famous Elafonissi beach which is organized and attracts many people and is known for the crystal clear shallow waters and coral sand large beach.